The Stafford Knot would like to thank each one of our supporters over the years and let everyone know if you ever have any questions at all including where the money we raise is donated please direct them to us at: editor@thestaffordknot.com. We are more than happy to answer your questions as we have done for many years even though legally the IRS doesnt demand this of us. We have an open book and always have. We volunteer our time and efforts out of loyalty and dedication to this breed. We are in the process of updating our donations list for 2017. Each year we make a donation to registered charities for Staffords around the world and also to individual rescue cases – sometimes directly to a foster, vet, boarding or transport volunteer. 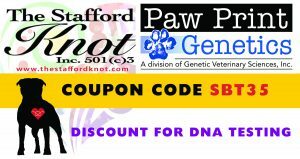 We have donated to many clubs rescue funds and also to health research for the breed with AHT, AKC and other groups. We change this list annually and the amounts are in direct correlation to how much we have raised that year and according to need. Donations are posted either on FB, this website or inside issues. We also post thank yous and letters of receipt. Please contact us via email with your suggestions – please include information for your suggested charity so that we may contact them for their paperwork and discuss their needs. If we make a donation and do not hear back from that organization, its is possible they may not receive further donations unless we hear from them directly. Again – we want to thank all of you for the continued support. TSK, Inc. has also funded many private rescue situations such as the Georgia Eight which was written about in detail in our magazine. Many other situations call for us to help cover the cost of transporting, veterinary bills, boarding and caring for individual rescues in volunteers homes throughout the year. We give what we can afford to give which is according to what we raise and receive as donations. Some years the bills are paid out of pocket and donations are slim, other years we are able to donate more or to more places. We do not take in great amounts of money but we aim to donate as much as we can every year. We depend upon your support. You may support us via Paypal and Venmo donations directly, bidding in our auctions, purchasing items we sell, Smile. Amazon donations, Cafe Press shops, calendar sales and the donation of automobiles in our name. We do not sponsor show trophies from our rescue funds but we do occasionally sponsor them with funds paid out of pocket of our team members as a way of marketing the company.